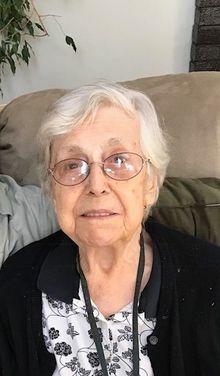 Obituary for Maria da Conceicao (Martins Sousa) Cabral | George C. Lima Funeral Home, Inc.
Maria da Conceicao (Martins Sousa) Cabral, 97 of River Street passed away on April 18, 2018 at Crestwood Nursing Center. She was the wife of the late Manuel Cabral. Born in Aqua do Pau, St. Michael, Azores, she was the daughter of the late Francisco and Maria da Luz (Vieira) Martins Sousa. She is survived by her children Joseph Cabral and his wife Paula, Alvaro Cabral and his wife Nancy, Agnes Cabral Massaro and Michael Cabral and his wife Sharon; grandchildren Marylou De Freitas, John Cabral, Christy Cabral-Smith, Nicholas Massaro, Matthew Massaro, Adam Cabral, Stacey Lombardo and great grandchildren Emily De Freitas, Maverick Cabral, Jaxon Cabral, Haleigh Resendes, Nicole Cavalieri, Ashley Smith, Madison Smith, Aiden Massaro and Maddox Massaro. She was the sister of Antonio Sousa and the late Manuel Sousa, Maria da Luz Vieira and Sofia Vieira. Mrs. Cabral was educated in Portugal and was employed by Converse and PF Industries before retiring. She was a former member of the Don Luiz Filipe Association and the Holy Rosary Sodality. She was a member of the Portuguese Charismatic Prayer Group for 24 years. Her funeral services will be held Tuesday, April 24th, 8 AM from the George Lima Funeral Home 367 High Street with a Mass of Christian Burial, 9 AM at St. Elizabeth's Church 577 Wood Street. Burial will follow in St. Mary's Cemetery. Calling hours are Monday 4-8 PM. Memorial donations may be made to: Beacon Hospice 1 Catamore Blvd Suite 1 East Providence RI 02914.